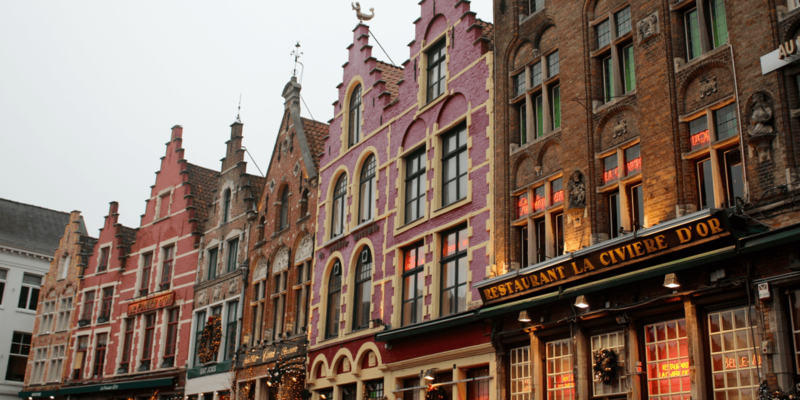 Friend and loyal patron of Ghost Whale’s, Klara Wertheim took a trip to Bruges for New Year and found some gems. It is a truth universally acknowledged that the cosy embrace of a pub is multiplied infinitely when it’s below zero outside. 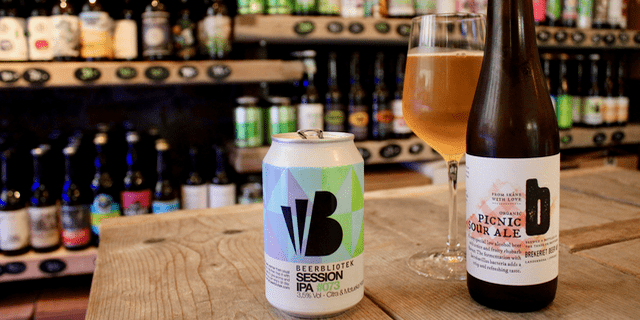 The act of ducking through the doorway, being hit by a blast of hot, hoppy air and removing your hat, scarf and gloves as you pick out a snug spot and eye up the row of taps – it’s like coming home, no matter where you are. As Bruges hit -1C this New Year, we were taking full advantage of the city’s beer obsession by ducking over a fair few hoppy thresholds. During the 15th century the city walls contained over fifty breweries, but this has now reduced to… two. Despite this depletion, on almost every cobbled street within the UNESCO World Heritage site historic centre, we found shop windows lined with hundreds of 33cl bottles and the pubs and bars were no different – frequently presenting us with an enormous beer bible to select from. The list shaped up quite differently from a typical London drinking establishment. Fruity lambics and krieks took up a lot of shelf space in the fridges, and strong weiss and blonde beers reigned supreme, as you’d expect in Belgium. The average percentage was a heavy 8 or 9%, and there was barely a typical pale ale or IPA in sight – this was great as it made us more adventurous. 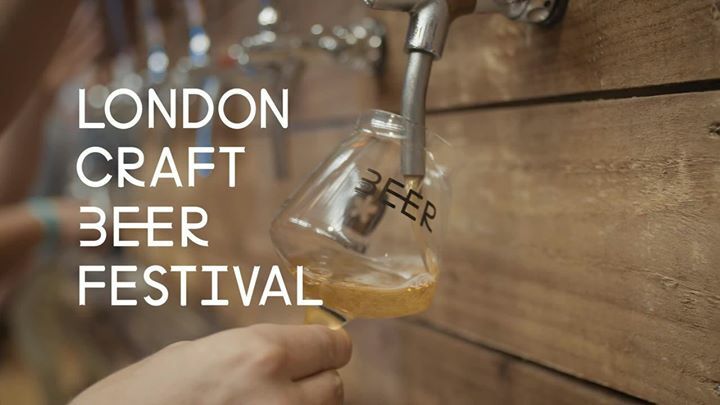 Lonely Planet informed us that each beer had its own glass and pouring method and, lo and behold, glasses in all shapes and sizes – from chalices to Viking horns – were produced out of nowhere for each of the huge selection of brews on offer. 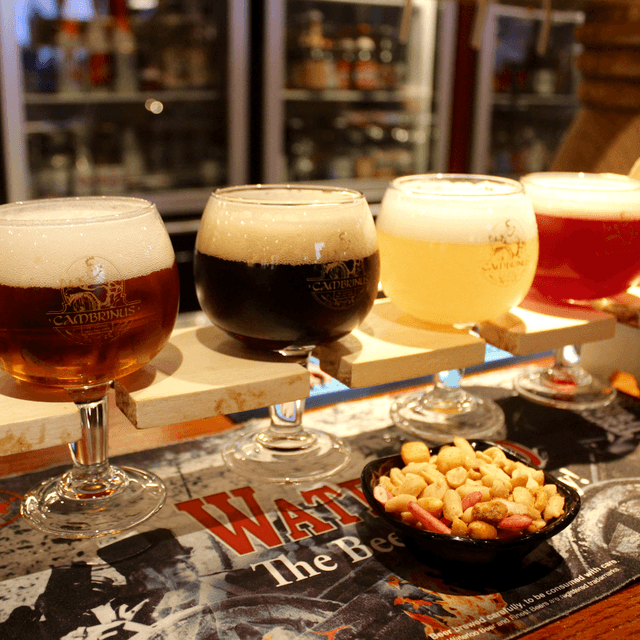 The most memorable beer was at De Garre, a gloriously Christmassy inn hidden down a tiny, cobbled alleyway. A quaint little gallery meant you could peer down at the punters on the ground floor below from upstairs (although we went one step further and surprised some locals by dropping our guidebook through the gap onto their table – luckily no beer was spilled!) 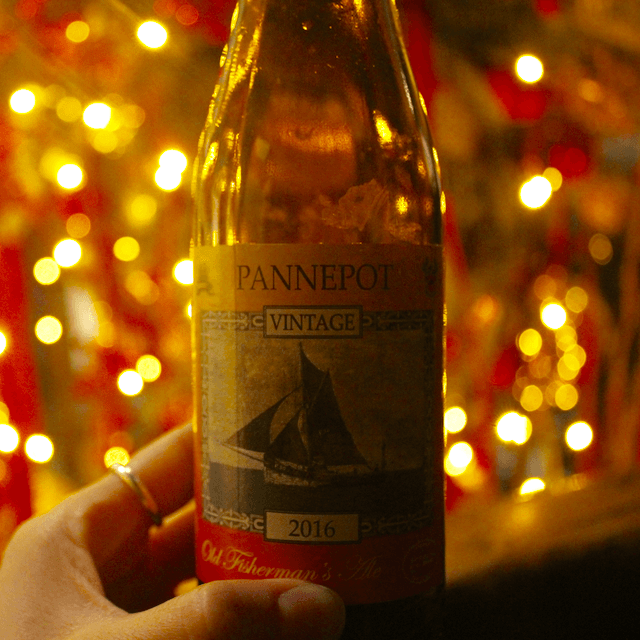 The brew was ‘Pannepot’ from Struise brewery – a 10% elixir of deep, coffee earthiness, hints of darkest berries and with a tinge of whisky-like heat. We’ve looked it up since and it is indeed aged on old whisky and calvados barrels. Truly delicious and spot-on for the wintry occasion. We also enjoyed the house ‘De Garre’, a triple ale with a golden roundness to it, brewed for the establishment by Brouwerij Van Steenberge. Next stop was the Bierbrasserie Cambrinus where ‘just drinking’ patrons are directed to sit on stools at the polished wooden bar. Beginning with the tasting board, we were a little underwhelmed – two of the brews were fairly bland and it felt like this might be a good way to get rid of them – but with our sweet tooth we liked Delirium’s cherrypop-tastic Christmas beer, and the festive brew from Prior Tugelo was a pleasant, hoppy ale. Things improved on round two with a supremely refreshing Saison Dupont – like a glass of champagne, it was summery, light, fruity – lovely. 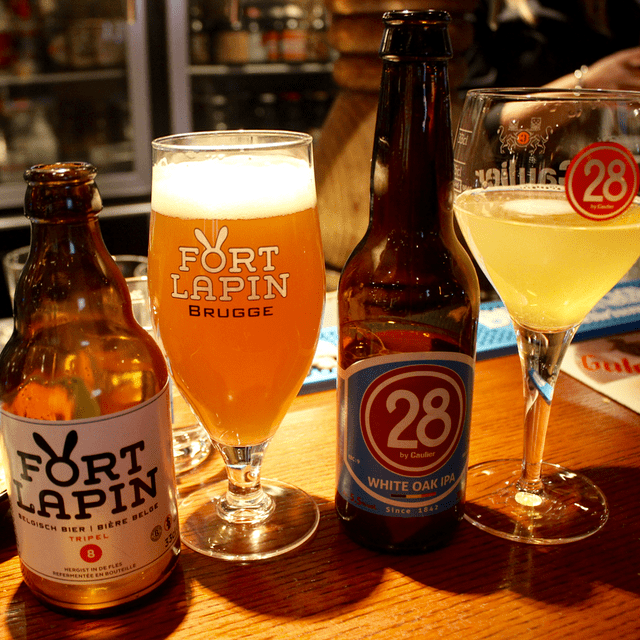 A couple of others worth mentioning – Fort Lapin’s ‘8’ (the triple) was a balanced and fruity drink that you could happily enjoy a few of over the afternoon. 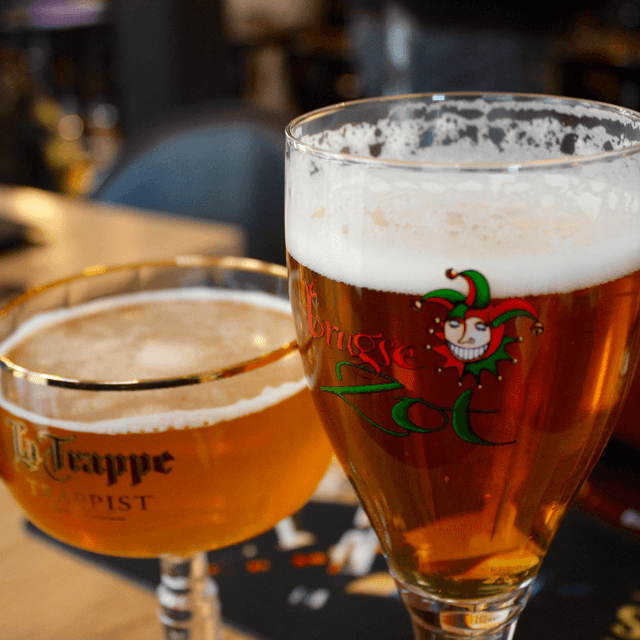 And even the ‘Brugse Zot’ (‘Bruges fool’), which is the ubiquitous fall-back beer in every Bruges drinking establishment, was a very decent fresh, golden ale with a restrained 6% ABV. We’re definitely going to need a return trip in order to visit the famous ‘De Halve Maan’ (Half Moon) brewery (brewers of the ‘Zot’) which was sadly closed – they hit the headlines across Europe last year as approval was granted for their construction of the world’s first ‘beer pipeline’ connecting their brewery with their bottling plant two miles away.